Mostogradnja is a civil engineering and construction company established in Serbia and specialized in the construction of bridges and engineering structures. Mostogradnja designs and builds bridges and constructs complete engineering structures or executes only a part of its specialized works within large projects according to its own or Employer's designs. Successful execution and long-standing experience in the designing and construction of varied structures at home and abroad made it possible for the Company to become the largest enterprise for the construction of large bridges and engineering structures in this part of Europe. The Company possesses construction plant and equipment, large truck cranes, heavy floating cranes and technical vessels, which enables it to carry out various and complex engineering structures. Construction of hydraulic structures of water supply, sewerage, dock facilities, heating pipelines, pump stations - Renney wells and wells with horizontal drains in fine sand, water towers, sluices, etc. Mostogradnja has a wide range of production activities and according to the results achieved so far, Mostogradnja is considered to be the leading company for the construction of large bridges and other engineering structures in this part of Europe. In order to get a clear picture of our possibilities and achievements, we should say that Mostogradnja has built 12 bridges over the Danube, all bridges over the Sava river in its middle and down course (total 16 bridges), many other bridges the total number of which exceeds 2,000 and the total length of which is about 250 km. In addition to its basic activity, Mostogradnja has gained remarkable references in the designing at home and abroad. Owing to its design staff and its designs Mostogradnja has introduced the new construction methods and application of new materials. Mostogradnja has opulent tradition in the construction of tanks for storing oil and oil derivatives, technical oils, acid, molasses, etc. So far, about 800 tanks, the total volume of which exceeds 2,400,000 m3, have been constructed. Of particular importance are those being fabricated in the industrial way - by rolling system as well as those with floating roofs. Another important segment of our activities covers fabrication and erection of all kinds of steel structures - steel structures for bridges, halls, industrial structures, hotels, conference halls, and fairs… So far, more than 300 halls have been constructed for many users at home and abroad. In our Production Plant at Batajnica, about 300 aerial posts have been constructed; the total length of which exceeds 15 km. Mostogradnja has completed the erection of these posts in the field, with complete equipment. Mostogradnja’s scope of activities includes hydro-engineering structures. A long experience and adequate technology made it possible for us to construct more than 200 km of water supply, sewerage and collector networks. Our products such as bearings and expansion joints are recognized and respected at the market, both as concerns up-to-date design proposals and the high quality of manufacture, long duration and low maintenance costs. A group of engineers, technicians and workers employed with the Directorate of the Yugoslav Railways was entrusted with a task to reconstruct the railway bridge over the Tamiš River (near Pančevo), which was destroyed during the World War II and to re-establish the traffic over it in the short period of time. 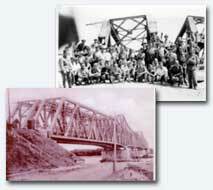 This group was an embryo of Mostogradnja, so that the 5th February 1945, when the reconstruction of the bridge commenced, is taken as the DATE OF ESTABLISHING MOSTOGRADNJA. In 1946 and 1947 were established the divisions for repair and construction of bridges over the Tamiš river at Pančevo, over the Tisa river at Titel as well as over the Danube river at Bogojevo. In July 1947, the Directorate of the Yugoslav Railways brought the decision on establishing Mostogradnja Railway Civil Engineering Company specialized in bridge construction. The Company had several headquarters located in the places where bigger projects were executed – Titel, Bogojevo, Šabac. Mostogradnja Railway Civil Engineering Company was relocated from Titel to Belgrade in the first half of 1949. In the middle of 1952, Mostogradnja disjoined the Railways and became an independent enterprise registered under the name GP Mostogradnja Beograd. In 1955, the Railway enterprise for repairing construction machines at Batajnica, joined Mostogradnja. In 1959, "Pioneer" Civil Engineering Company from Belgrade, also specialized in bridge construction, did the same. Under the joint name, MOSTOGRADNJA became a specialized company for the construction and erection of all kinds of concrete and steel bridges and for the construction of other civil and water engineering works. In the seventies and eighties, an intensive economic development at home enabled the construction of a series of new roads and significant structures, such as highway bridges, bridges over the Danube, Sava River and other major rivers, even across the sea. Considering around 5,000 employees and available equipment, even at that time there were all potentials available that had been revealed in the construction of Gazelle Bridge, Mostar and Autokomanda Interchanges, bridges over the Danube, such as the one near Beška, Mainland-Krk Island Bridge, etc. In the early eighties, Mostogradnja was on the list of 250 greatest construction companies in the world in relation to the value of investment contracts with foreign partners. Hence, the most important achievements abroad, apart from the bridge construction, were reached in fabrication and erection of steel structures - halls, hangars, tanks, aerial posts and various structures meant for industrial and military facilities in European, Asian and African countries. Apart from financial effects, these contracts have also contributed to the name and reputation of Mostogradnja and its Plant of steel structures at Batajnica that very soon became a famous name in this field of activities. One should particularly respect the fact that, at the beginning of the new millennium, Mostogradnja is still the leading company in the construction of large bridges. We believe that now, under more favorable political and economic circumstances, privatization, further development of the quality system and work productiveness will enable further development and creation of a modern civil engineering company. This is what we aim at. Mostogradnja is a joint stock company with about 1,500 employees and a large number of graduate civil engineers, technicians, and specialists for particular production fields and qualified personnel in supporting services. Production is of a high quality complying with the world standards. Mostogradnja is the first civil engineering company at home to hold local and international Quality Certificates YUQS, SQS and IQNET since 1997. Mostogradnja AD is the leading company at home for the construction of bridges, tanks and aerials. A well-established production program and a wide range of activities make it possible for Mostogradnja to achieve remarkable results in other field of activities of the same importance. There are Profit Centres within Mostogradnja: "Beograd", "Batajnica", "Novi Sad", "Mehanizacija" and "Ugostiteljstvo"; as well as the Company Daughter in Podgorica.